View More In Krill Oils. The health benefits of omega 3’s are incredible, and with over 25,000 scientific studies on their benefits, it’s safe to say they are 100% real – no over exaggerated claims or cherry picked data. Make no mistake, Omega 3s are crucial to your body and brain. They are used to create important signaling molecules that turn off inflammation. They help neurons function and are used to make hormones. They build walls of cells, arteries, and nerves. And the only way to get them is through diet or supplements. If you’re going to take an Omega 3 Supplement, it should be Krill Oil. Krill oil is a lot like fish oil, only better. What does that mean? The Omega-3s are stored in a form that is absorbed and used by your cells more quickly and efficiently than the triglycerides in fish oil. It means less waste and higher value. You use more of what you take. Krill naturally produces astaxanthin, one of the most potent antioxidants on the planet, more than 5000X stronger than vitamin C! This keeps your oil fresh and protects your body from oxidative stress. Ecologically, krill is superabundant and at a very low risk for overfishing. It is also low on the food chain, accumulating less toxic waste compared to fish. Krill just makes more sense. Whether you’re looking to improve your health or push yourself towards peak performance, Krill Oil will help you get there. BETTER THAN FISH OIL - You've heard about how good omega-3 fish oil is for your health, but did you know that krill oil provides the same omega-3 fatty acids stored as phospholipids making them much easier to absorb? Krill Oil delivers more of this important nutrient to your tissues and cells when you need it most. ANTI INFLAMMATORY - One of the biggest contributors to disease is inflammation. 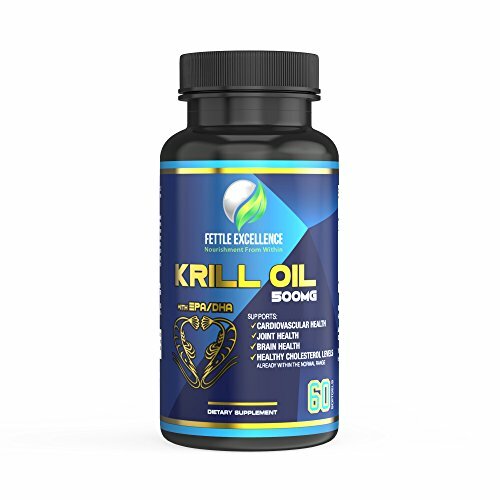 The anti-inflammatory properties of Krill Oil help soothe inflammation and bring your body back into balance so it can function at its optimum level. INCREASE BRAIN POWER - Focus, concentration, the ability to recall information quickly and accurately - when brain power falters, it affects your entire life and keeps you from finding the top of your game. Omega-3s are crucial for optimal brain functioning, and Krill Oil delivers it to your neurons and synapses in the quickest, most efficient way possible. EASE JOINT PAIN - Joints that have endured years of wear and tear are craving a boost of power fats and the best you can offer is omega-3 fatty acids. Lubricate and loosen up your joints so your body can play again, work harder and get through the day with greater ease and comfort. POWERFUL ANTIOXIDANTS FOR ALL AROUND BETTER HEALTH - We all know antioxidants are good for you, but why? Antioxidants help your cells handle harmful oxidation by neutralizing free radicals that can cause extensive cell damage when left unchecked. Astaxanthan is one of the most powerful anti-oxidants, 5,000 times more powerful than Vitamin C, and is found naturally in krill. If you have any questions about this product by Fettle Excellence, contact us by completing and submitting the form below. If you are looking for a specif part number, please include it with your message.